Journey forth with new tires from Yokohama, Nexen, Bridgestone, and other major brands. We have a wide inventory of car, light truck, and SUV tires for your everyday driving needs. We also stock commercial tires, farm tires, and industrial tires. Find everything you need for your personal car or professional equipment. Call (505) 722-6668 if you have questions or would like assistance during your search. The world is full of choices. Shaffer Tire Inc. makes it easy to match the right tire to your vehicle. Since 1973, families and businesses across McKinley County have come to us for tire sales and guidance. Over our years in business, we've expanded our inventory and connections to provide the best tire brands to our customers. In addition to serving as your Gallup tire dealer, we provide select automotive services. Keep your tires healthy with tire rotation and balancing, or talk with us about brake repair, suspension repair, and wheel alignment services. Call (505) 722-6668 to schedule an appointment with a member of our team today. 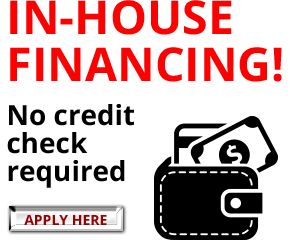 Financing is available. We're located at 610 West Maloney Avenue Gallup, NM 87301. Come in during our store hours Monday - Friday 8:00 AM to 5:30 PM and Saturday 8:00 AM to 4:30 PM.